Ιδανικό για χαλάρωση και διασκέδαση, το Ningxia Stay βρίσκεται στην περιοχή Ντατόνγκ της πόλης Ταϊπέι. Μόνο 1.7 KM από το κέντρο της πόλης, η στρατηγική θέση του ξενοδοχείου διασφαλίζει ότι οι επισκέπτες θα έχουν γρήγορη και εύκολη πρόσβαση σε πολλά από τα τοπικά σημεία ενδιαφέροντος. Με την βολική του τοποθεσία, το ξενοδοχείο προσφέρει εύκολη πρόσβαση στους προορισμούς της πόλης που πρέπει οπωσδήποτε να δείτε. Το Ningxia Stay προσφέρει άψογη εξυπηρέτηση και όλες τις βασικές ανέσεις στους ενθουσιώδεις ταξιδιώτες. Για την άνεση και την διευκόλυνση των πελατών, το ξενοδοχείο προσφέρει δωρεάν WiFi σε όλα τα δωμάτια, ημερήσιος καθαρισμός, παράδοση ειδών παντοπωλείου, φύλαξη αποσκευών, ασύρματη σύνδεση Wi-Fi σε δημόσιους χώρους. Επιπλέον, όλα τα δωμάτια διαθέτουν ποικιλία ανέσεων. Πολλά από αυτά παρέχουν ακόμη και επίπεδη τηλεόραση, καθρέφτης, παντόφλες, πετσέτες, σύνδεση internet (ασύρματη) προκειμένου να ευχαριστήσουν ακόμα και τον πιο απαιτητικό επισκέπτη. Εξάλλου, το ξενοδοχείο διοργανώνει πολλά ψυχαγωγικά δρώμενα έτσι ώστε να έχετε πολλά πράγματα να κάνετε κατά τη διαμονή σας. Με την ιδανική του τοποθεσία και τις καταπληκτικές του υπηρεσίες, το Ningxia Stay θα σας ευχαριστήσει σε πολλά πράγματα. The rooms are tiny but clean. Apart from the air-conditioning, the room has a fan as well. Lots of TV channels, wifi is stable. Toilet is pretty modern. They provide, toothbrush and toothpaste, towels (very thin ones) and a hairdryer. When we checked out, the receptionist let us leave our luggage at the tiny reception area. As we were a group of 4, she told us that it would make more sense to call for a cab to the airport instead of taking the train. Location wise, the closest train station is Daqiaotou on the red line which is about a 5-7 mins walk. Shuanglian on the red line is about a 13-15 mins walk away. This little homestay is near Ningxia night Market. The building next to it houses Carrefour which opens til 2am. Adjacent to Carrefour is Starbucks. The staff was very friendly and the location is very close to Ningxia Night market. Going around the block will lead you to lots of street food and local foodie. We had fun staying in ningxia. I requested a lower level floor for my parents as they have difficulties with the stairs (note that the lift will cease operating after 10pm overnight). Really loved this place. Clean room and bathroom; They clean the place everyday. Resupply the complimentary drinks. :) And accommodating staff. I'll definitely book this hotel when I go back to Taipei. Recommended to all/any traveller. 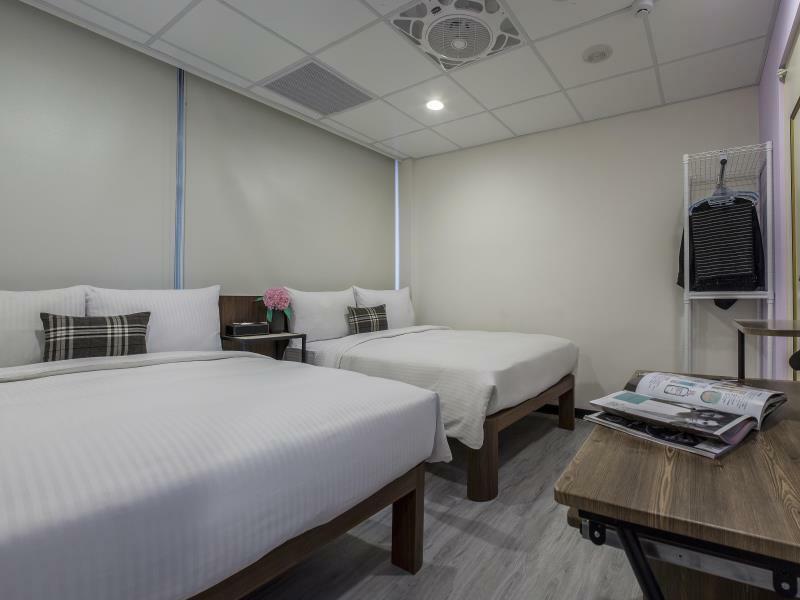 500m from (Da Qiao Tou) MRT Large bed and nice staff..
A bit small (nearly any space for our luggage also know possibilitz to leave the luggage there after the check out or the before the check-in) and in most rooms the window is missing but otherwise especially regarding the price it's perfect. Above all, I want to emphasize the service. Every day our room was cleaned, the sheets changed, we got knew towels and coffee and tea packets. The establishment is great! The staff is very helpful. The facility is well managed even if the staff is very minimal. Housekeeping is spot on. Location is very safe and accessible to any other places. 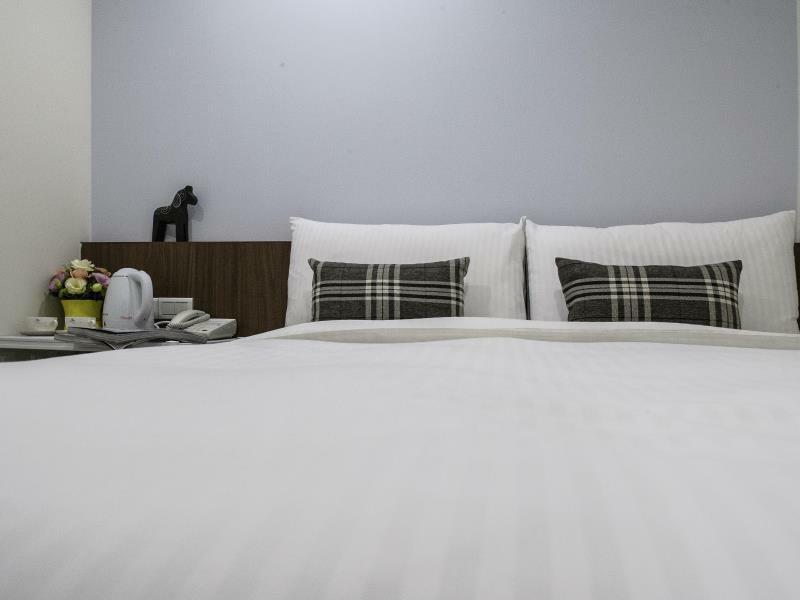 The location is just a few minutes walk to the Ningxia Night Market and a few more steps to the nearest MRT station. Convenience stores and grocery with foodcourt nearby. The room was actually a bit small, but I did not feel bad about it. It was cozy and clean. Staff was accommodating. Will stay here again in my next trip to Taipei. Hotel meet all basic need, they refill bottle wattle, slipper and change tower everyday. Hotel is still new like what u see in picture that they put online. Actually i would like to cancel my booking 3 days before i check in to the place due to my flight was cancelled and our flight change to night arrival in Taipei. I am so worry about the escalator service from 10am-10pm mean that i need to carry my luggage and climb the staircase. However after i call Agoda for the escalator service and wanted to cancel my booking. Hotel make some arrangement. When i arrived in hotel after 10pm, i don't need to climb the staircase. 4 days i stay in the place, the escalator is working 24 hours. Hope their escalator service is running 24 hours in future but not only 4 days because the staircase is very deep and bit dangerous. I made a last minute booking for a night stay. After booking I found out that it was not really hotel where there should be a reception area. I waited for quite some time to check in. The place was decent and clean and I had a good rest. I went out at 10 and learned that the elevator works only until 10pm. The room is very small but the bed was super comfortable. Slept like a baby. It was quiet and really clean. A fantastic food night market is a short walk, about two blocks away. Convenient to subway lines and there's a grocery store next door. Overall great place to stay. Nice clean place, friendly alert staff. Fridge in rooms, large screen tv with lots of channels. 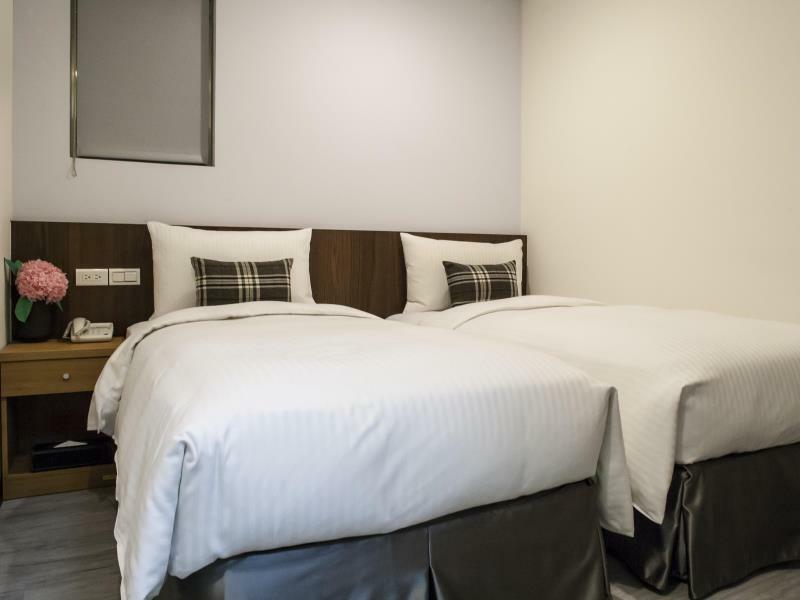 I would recommend to pay just a little extra and stay with 1-2 people in the '4 persons' room. In order to enjoy a large room with street view! A short walk from Datouqiao MRT station roughly about 5 mins and nearer to Ningxia Night market. You could go to Taipei Main Station all your shopping needs but it would be best if you can register a bike Ubike to cycle will be much much better to walk to Taipei Main Station. Rooms are quite small but still satisfactory, while the toilets look and design are better. Everything was ok. The only problem was the elevator only works from 10am to 10pm so if you are stay on 3rd or 4th or 5th floor you will have to spend more energy to climb up stair. Good location and clean. But noisy at night. Thank you for your commend. Looking forward to server you next time. The location was convenient and the room was clean even though it was small. The building itself was difficult to find, but it is a safe location. Double bed, old linen, very small room, no windows, functional shower and bathroom. Nothing special, meets basic needs. near super market and night market. room is small but neat and clean. The air con is strong enough. Σταθμός Μετρό Daqiaotou στα 0.52 χλμ.